We Deal in all Types of Coffee Mugs such as Printed Birthday Mugs, Friendship Mugs, PLAIN WHITE MUGS which are required Specially for Corporate Companies where the company prints their LOGO on the mugs. 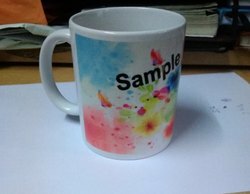 Plain White Mugs starts from Rs60/- to Rs.70/- & Printed Mugs from Rs.90/- & above as per the sixe & design upto Rs.200/-. If the Quantity is More Price will be Negociated.